Rose, Mike. "The Poem is a Substitute for Love." Lives on the Boundary: The Struggles and Achievements of America’s Underprepared. (New York: Free Press; New York: Simon & Schuster), 1989. 67-83. Richardson, Elaine. "Introduction: don’t we still have to prove our humanity?" 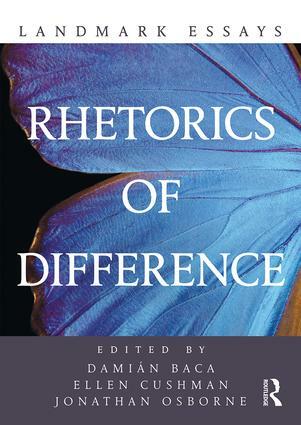 and "African American-centered rhetoric, composition, and literacy: theory and research." African American Literacies. London: Routledge, 2003. 1-5, 95-113. Pritchard, Eric Darnell, and Maria L. Bibbs. "Sista’ Outsider: Queer Women of Color and Hip Hop." Home Girls Make Some Noise: Hip-hop Feminism Anthology. Edited by Gwendolyn Pough, Mark Anthony Neal, and Joan Morgan. Mira Loma: Parker Publishing, 2007. 19-40. Ratcliffe, Krista. "Rhetorical listening: A Trope for Interpretive Invention and a ‘Code of Cross-Cultural Conduct.’" College Composition and Communication 51, no. 2 (1999): 195-224. Horner, Bruce, Min-Zhan Lu, Jacqueline Jones Royster, and John Trimbur. "Language Difference in Writing: Toward a Translingual Approach." College English 73, no. 3 (2011): 303–21. Ellen Cushman is Dean’s Professor of Civic Sustainability and Associate Dean of Academic Affairs, Diversity and Inclusion in the College of Social Sciences and Humanities at Northeastern University. A citizen of the Cherokee Nation, she is the author of The Cherokee Syllabary: Writing the People’s Perseverance (2012) and coeditor of the forthcoming 2nd edition of Literacies: A Critical Sourcebook (with Christina Haas and Mike Rose).